Editor’s note: This interview first appeared summer of 2017 in CBLDF Defender Vol. 2, Issue 2. 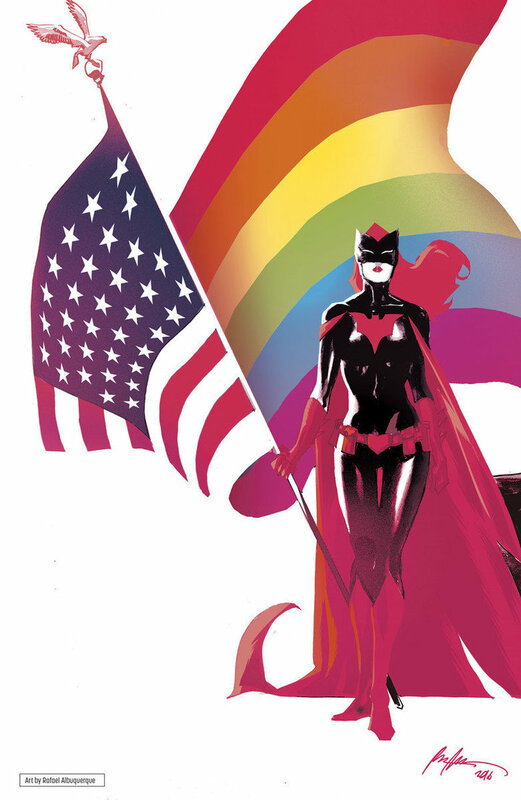 As we approach the second year anniversary of the horrific shooting at Pulse nightclub, this is a look back at the queer comics community responding to the tragedy and utilzing comics as a platform for activism and change. José Villarrubia: What was your personal reaction to the tragedy at Pulse Nightclub? What thoughts first crossed your mind, in what it meant to you and to the gay community at large? Marc Andreyko: Initially, I got sick — felt punched in the gut and had dry-heaves for a few minutes. And I initially flashed back emotionally to the darkest days of the AIDS crisis, when death was swift and everywhere. In some ways, we had come so far, but in others… well, hate is really hard to extinguish sometimes. JV: How familiar were you with previous comics anthologies, like AARGH!, Strip AIDS, and Hands Off!, that specically addressed homophobia? MA: Of course! As a gay kid growing up in Ohio, finding comics that had gay content? Yes, please! I still have my copies of all of these books! And those books, along with the “fundraiser” culture of the ‘80’s — Live Aid, “We Are the World,” Comic Relief, et al. — are the inspiration for Love Is Love. JV: What goals did you want to achieve, artistically, socially, and politically? What were your criteria for the creators included? MA: I just wanted an outlet for our collective grief and a way to help the victims initially. It was a knee jerk reaction to the tragedy. As the list of contributors (and the diversity therein) grew, I started realizing that this book was taking on a political component simply by having such A-listers and big publishers support it so loudly and freely. And that political statement was our title — Love Is Love. My criteria for creators were simple: have a point of view and get the page in on time! I also approached some of my superstar pals to contribute — knowing that the more contributors we had with “names” and/or large fan followings, then hopefully more attention and sales would follow. JV: Was anyone you asked to contribute against the idea of doing this book? MA: God, no. Anyone who would feel that way is not someone I would be friends with or respect artistically. JV: What were the biggest surprises for you once the work was all assembled? MA: The biggest was how consistent this book is. Anthologies are tough — ones with a six-month-from-idea-to-shelves turnaround are even tougher — but I read this book and am in awe of how powerful they all are. Hats off to my editors, Sarah Gaydos and Jamie Rich, who put the pages in order and masterfully controlled the rhythm of how you read it. On a personal level, I think Kaare Andrews’ piece, in its simplicity and emotion, is the piece that makes me cry just thinking about it. JV: What was the most challenging aspect of taking on such a massive project? MA: Coordination. Communication. Hitting deadlines. All the stuff editors deal with every day. But this one had over 300 artists, writers, colorists, and letterers involved. Looking back, I am amazed at the relative ease with which this happened. JV: Do you have any regrets? Anything you would have done differently? MA: My only real regret is some of the people I wanted to get, who I simply couldn’t find a way to reach or who were not available. But that is “regret” all in lowercase. I could not be prouder, happier, or more humbled by the final product and all the creators who so generously donated their craft and time. JV: Do you see the need of further anthologies like this, or do you think there may be a “burnout” effect if they are published when there is not an emergency? MA: It is tough. I do think we need to give back more as a species, but I also think a “burnout” effect is a real risk. We live in a time where the news cycle is so fast that the next big story is only minutes away. I did actually have someone tell me that no one would care since the book was coming out six months after the massacre, and I was slack-jawed by the comment. My thought was, “If you’ve forgotten about this in six months, you are awful,” and we just plowed ahead. Unfortunately, I think these projects only work when they are a reaction to tragedy. Look how much blood donations go up when there is a hurricane or a tornado. We as a race seem to only react en masse to “big” events (which is another issue entirely), so I think a regular charity book would be tough going. JV: Half of the books on this year’s top ten most challenged books list from the American Library Association were challenged for LGBTQIA content, including the top two titles, which were graphic novels: This One Summer and Drama. What do you personally make of this? MA: It’s typical. People want straw men to go after, and focusing on books is an easy target. The people that challenge books generally don’t read many to begin with, and, like One Million Moms, are small but vocal groups who would better use their energies elsewhere if they really cared about people. Posers wrapped in (usually misrepresented) bits of scripture. I mean, who doesn’t want their kids to read? Letting them see Fox News is actually exponentially more damaging than a graphic novel about love. JV: Is there anything else you’d like to add and that you have not been asked about this project before? MA: I’d just like to thank everyone — from creators and editors to production people to everyone who bought copies. So far, we have raised about $170,000.00 [for the victims, survivors, and their families] and are going into a fifth printing! We are keeping the book in print, as well as having many foreign editions in the works around the world. It is so humbling and inspiring to see a project that started as a reaction to such pain and loss has become bigger than anyone could have imagined. Love is love, indeed. Josè Villarrubio is a respected artist, art professor, and colorist within the comics industry. He has won a Comicdom and a Harvey Award, and been nominated twice for Eisner Awards as a colorist. He produced two books with writer, Alan Moore – The Voice of Fire and Mirror of Love. As a colorist he has collaborated frequently with Jae Lee, Bill Sienkiewicz, J.H. Williams III, Paul Pope, Jeff Lemire, and many others. Villarrubia chaired the Illustration Department at the prestigious Maryland Instititute College of Art from 2011 – 2016, and has taught at many other amazing institutions. His art has been exhibited all over the world. Marc Andreyko co-wrote the limited series Torso with Brian Michael Bendis, co-created with P. Craig Russell,What Is It That Disturbs You, Stephen?, an award-winning Marvel one-shot featuring Dr. Strange. He has written DC Comics’ Manhunter series, Batman, Batwoman, and Wonder Woman ‘77. He has written comics for Dark Horse Comics, IDW Publishing, and Todd McFarlane Productions/Image Comics. Andreyko organized and edited the Eisner award-winning anthology Love Is Love, which benefited the victims of the Pulse nightclub shooting in Florida.